Sláinte (pronounced SLON-CHA) is the Gaelic or Celtic equivalent of the friendly toast, "Cheers" or "To your health!" Just saying it out loud makes you wish you were Irish, huh? In fact, many of the residents of Dublin,Ohio have embraced this vibrant culture from across the Atlantic by partaking in many of the traditions which makes Dublin,Ireland so interesting. Next Thursday, May 19 marks the first Sláinte Thursday of 2011--a fun evening of cheer in the the City&apos;s Historic District. 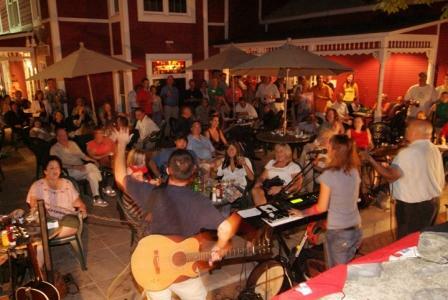 These exciting third Thursday celebrations are held throughout the summer months in Dublin, Ohio. Beginning at 4 p.m., restaurants are buzzing with live music while shops and businesses ready for a steady stream of visitors to the area. Specials, open houses, children’s activities and food sampling create a swirl of activities for all ages. Created for locals and visitors alike, a Sláinte Thursday celebration is just right for those warm summer nights. Live musical melodies at several locations throughout Historic Dublin lead people from place to place as they visit the district. My favorite is part of the evening is walking along the brick sidewalks under the canopy of shade trees. It’s so quaint, yet hip! No one is pushing me to a deadline (unless it’s getting the last taste of a special in one of the many great restaurants). Catch the Trolley as it passes by each hole, if the walk is too much for you. From 6:30 p.m. – 8:30 p.m. the Trolley loop will follow South High Street up to the library and back. Or just meander up and down the sidewalks, enjoying an ice cream or iced tea, a little patio dining, some great shopping and plenty o&apos; fun! See you Thursday, May 19! Sláinte! For more information about Sláinte Thursday, visit www.HistoricDublin.org or the Dublin Convention & Visitors Bureau website.